device and due to the reinforcement of the band loops and the bolts higher torques can be used. New specially designed bolt with integrated spacer = improved efficiency. Reinforced loops = allow to withstand significantly higher torques. 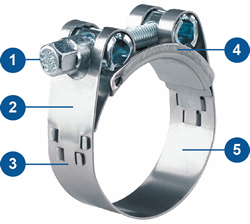 Mechanically locked closure = no welding points & no contact corrosion. Bridge = optimal hose protection. Robust band with rounded edges = protection against injuries and damage to the hose surface.